I was looking through my old blog for fun and ran into a post about 電車男. 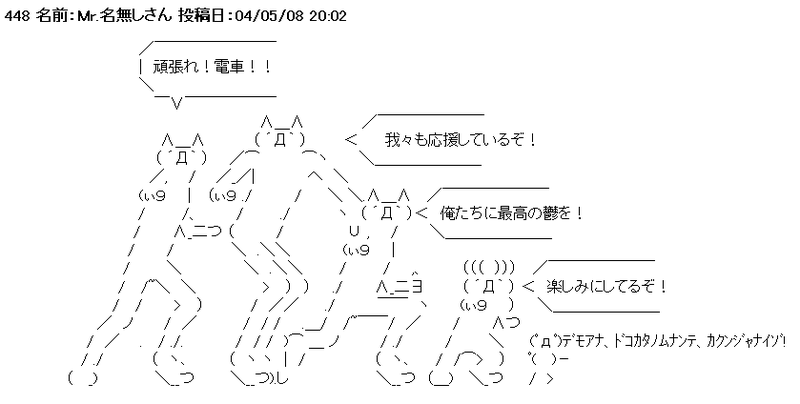 Though the post is over 2 years old and the height of 電車男’s popularity is long past, the original story (with some commentary) as it unfolded in the 2ch BBS is archived and still around for anybody to read for free (on a geocities account no less). If you’re not familiar with the immensely popular 2ちゃんねる BBS, it’s basically an non-threaded forum where everybody posts anonymously. There are no “fancy” features like registration and passwords. You can put whatever name you want, so most times, you have no idea who is saying what. This and the crappy UI from the 90s makes for an experience I’d like to call “craptastic”. Fortunately, the archived version of the original content has been edited and neatly organized for us. In this post, I’ll take a quick sneak peek of the beginning to introduce you to the story. Before you decide to read it for yourself, I should warn you that it’s full of internet slang that would probably be useless anywhere except… the internet. Ok then, let’s look at the first section! It begins with a cryptic message from Nameless-san on a random thread in March 2004. It’s impossible to know what he’s talking about without the previous messages but we can discern that he betrayed something somehow （裏ぐる is apparently internet typo/slang for 裏切る）. The commentator helpfully adds that it was just an “ordinary thread with nothing special” anyhow. His first message saying he can’t say how he betrayed [whatever] because he has not talent in literature gets people wondering what happened. One person asks whether he got a girlfriend. He replies no but it’s a big chance. He’s obviously flustered because he then retracts his earlier statement and says he needs to calm down. Finally, somebody tells him to give all the details. キボン is internet slang for 希望. Finally, he reluctantly agrees to write about what happened. Because he has been only 「ロムる」ing, meaning “Read-Only Member” or what we call a “lurker”, he asks that he not be laughed at. At this point, he isn’t even known as 電車 and is writing as 731, the number of his first post (remember they’re all anonymous). Here’s how the story begins. Whew! And that’s how he first met the person we’ll only ever know as エルメス. I think that’s enough for now so I’ll end it here. But to sum up, at the end of the incident she asks him for his address and later sends him a thank-you gift for his braveness and chivalry. More importantly, the receipt for the delivery has her number on it! What will you do 電車?!! I think it’s really cool that parts of the original threads are still available for free online especially since I believe there’s a book out as well. If you don’t mind weeding through internet slang and banter, I’m sure there’s a lot of good primary reading material here. Otherwise, be sure to check out the drama and/or movie. I haven’t watched the movie but the drama was pretty good. They sure did pick a nerdy guy for the main character. 電車男 is one of those perfect nerd fantasies where the main character meets a beautiful women in a chance encounter and through luck and perseverance ends up 「ゲットする」ing the girl. What makes this story special is that it was originally told on an internet forum and with input from regular netizens along the way. Plus, it’s real as far as I know. I think we’re all curious about what エルメス looks like! In addition, the time and effort people put into cheering 電車 on is very touching. The graphics are simply amazing as well! Who says you need fancy features like image uploads or BB code?! Let me know what’s going on now! Japan is a country where everybody goes from one crazy fad to the next such as ヨン様 (ugh…), Hard Gay, and 涼宮ハルヒの憂鬱. 電車男 was certainly a media phenomenon in its day spawning a book, movie, drama, manga, and even appearing in theater. I haven’t been in Japan in over a year and I’m a bit out of touch so please let me know about any new fads going on! This entry was posted in Advanced, Culture, Vocabulary by taekk. Bookmark the permalink. Marxy at Neomarxisme has cast serious doubt on the non-fictionality of the story. Oh no, really? Any link to the evidence? It does seem shady now that you mention it. If it was fake, I’d still have to admire the author’s originality. omg.. i would have given up halfway thru.. oh wait. i did. Thank you! This fits a staggering number of real-life situations!